When I joined Ada's Cafe in March 2016, the non-profit organization was making huge strides towards its mission: helping people with disabilities achieve employment and independence. While employees were benefiting, the organization was struggling from a business perspective. They were barely breaking even with large grants and donations, their digital presence was lacking, and in-store purchases were barely covering the cost of high-quality ingredients and the fair wages they paid their employees. The Navigation too complicated, and didn't satisfy users' needs (menu / catering were not featured), the information architecture was unclear, and Ada's received few donations through the website. With regards to look and feel, the site looked out of date, and the visual design was unappealing. It didn't convey Ada's true purpose and identity. We performed background interviews with the owner and manager of the cafe, followed by generative and evaluative initial customer research. 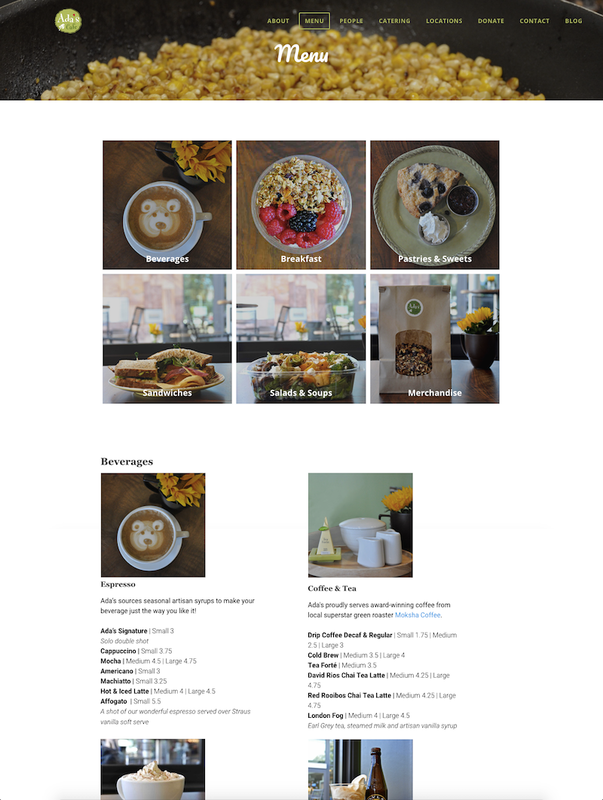 We then researched how similar organizations (Philz Coffee, Coupa Cafe, Peet's, Starbucks, Palo Alto Cafe, and Blue Bottle) designed their websites and social media presences, before creating some initial prototypes and using the RITE Method to user test. The main website users are Palo Alto and surrounding areas residents (middle-aged (30s-60s), parents, affluent, goals: Want to know the hours / address / menu), followed by small business owners / event coordinators who want to cater office events, and finally VCs and philanthropic foundations looking to fund nonprofits doing good in the local community. Jeannine is based on the majority of the customers we observed, met, and interviewed at the physical Ada's Cafe location. While there were a few fathers, teenagers, and seniors, about 70% of the customers were Palo Alto mothers with their young children in tow, looking for a good cup of coffee, healthy food, and a family-friendly environment. "The text and image look old school"
Replaced "Donate Now" with "Learn More"
Users did not want to immediately donate (especially without knowing about the NGO), and were much more likely to donate or visit after reading the "About" page. Moved social media icons to the bottom, as users never clicked on them at the top of the page. Requires no maintenance, which is more appropriate for the Ada's Cafe team — they don't have much time to update time-sensitive notices.